Welcome to "The Greatest Pirate Story Never Told!" Off Broadway's Interactive, Improvised Pirate Musical! …with a splash of “Monty Python” and “Mad Libs” tossed into the mix! "The Greatest Pirate Story Never Told!" is Off Broadway’s improvised, interactive, musical pirate adventure filled with boatloads of laugh-out-loud moments for both kids and grown-ups! The Plot: Flung into the future by a musical-loving Sea Witch, a crew of misfit pirates-turned-actors must now perform the greatest pirate epic ever seen on stage! But when their script is partially obscured by a tragic squid ink accident, the crew must turn to the audience to fill in the missing bits of the plot. The crew then improvise their musical adventure, seamlessly weaving the audience suggestions into scenes, songs and more! Full of swordplay and wordplay with a boatload of laughs for pirates age 4 to 104, this swashbuckling musical is never the same show twice!! Says The New York Times: “More laughs than there are bones in Davy Jones’s locker!” The show was nominated as “Best Family Show 2014” by the Off-Broadway Alliance Awards. Community outreach and Improv Workshops are available. Be sure to ask about the special “ARRRR!” Rated version for audiences 18+. 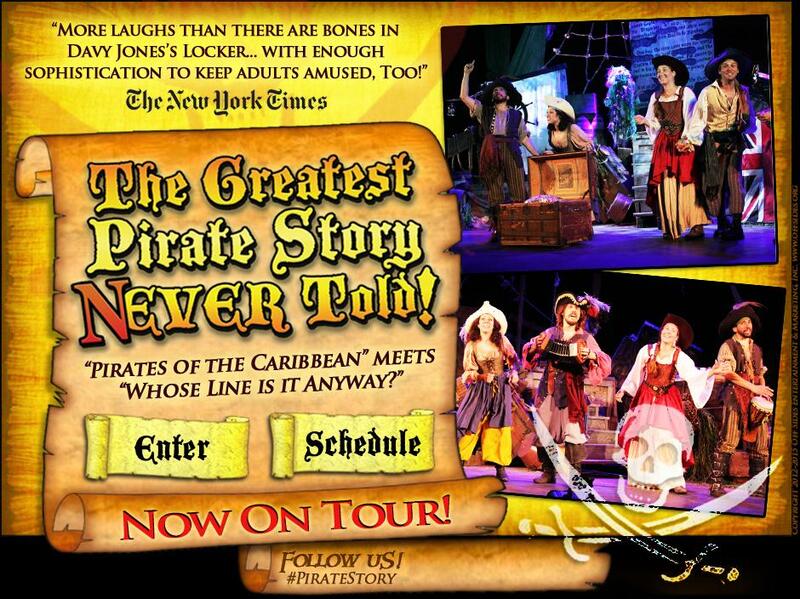 #piratestory Click above for tickets, including our amazing online sale for discount tickets.